Last year 8th grader Ernesto Castro wanted to be a mechanic when he grew up. But after he attended an Arduino coding training, his MESA teacher had a future mechanical engineer on her hands. 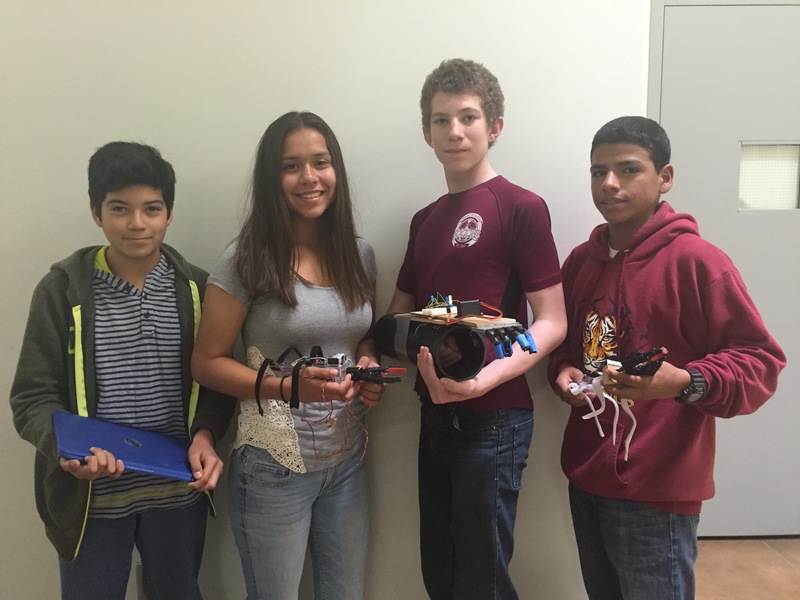 Castro is part of a four-student team from Los Banos Junior High School headed to the National Engineering Design Competition in Utah next month. They beat teams from across California to build the top-performing robotic prosthetic arm powered by an Arduino coding kit. Each student has spent about 120 hours throughout the school year designing, testing, building and rebuilding the arm. The team replicates the full R&D experience with a technical paper, oral presentation and performance evaluation. Through the prosthetic arm project, they are bridging classroom to real world, but also gaining the communication and teamwork skills needed to be a successful professional. After seeing their fellow Los Banos Tigers make it to nationals, a surge of students are now interested in an upcoming coding training. In the Central Valley city of Los Banos the median household income is $45,600 and just 10 percent of residents over the age of 265 have bachelor’s degrees. All four of the national’s students will be the first in their families to go to college. And according to senior test engineer Eric Ramirez, the MESA students are learning things many college students don’t even have experience with. Ramirez, who works for the medical technologies company, Stryker Corporation, volunteers with the Los Banos MESA team. He said the engineering design software the team uses is foreign to some novice engineers, and the soldering skills they’ve gained can rival first-year engineering students.